Police Chief Paul Ferreira was named to the police chief’s position by the Hawaiʻi County Police Commission on December 8, 2016, and assumed the role at the close of business on December 30, 2016. He had previously served as Deputy Police Chief since December 2008. 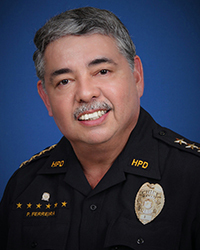 Ferreira joined the Hawaiʻi Police Department in July 1982. During his career he worked as a patrol officer and a detective and held several positions in the Administrative Bureau, including assistant chief, where he oversaw Finance, Human Resources, Training, Safety, Workers Compensation, Research and Development, Word Processing, Records and Identification, Communications Dispatch, Communications Maintenance, Traffic Services, the Computer Center and the non-tactical activities of the Special Response Team.